There isn't a specific day or month to prune your tree; however, there is ideal seasons and weather conditions that you should aim for. Similar to trimming best practices, we often suggest pruning your trees during cold weather months. Many of our clients are often surprised by this, but when you really think about it, it makes sense. Throughout the winter, trees are dormant and they have typically stopped growing for the season. Therefore, they’re able to conserve their energy so that they are able to heal faster when pruning cuts are made. This is opposite to the idea of pruning in the spring, when trees are in the middle of their prime growing season. Pruning in the spring can cause harm for a few different reasons. The most important reason is that since they are in their most active phase, pruning them will hurt them more than if they were dormant. It will not be able to repair itself as effectively since it is already in its most active phase, so the injuries given to the tree by pruning it cannot be healed as well. This can cause some serious health problems for them. When you prune during cold weather months, like December, January and February, you are putting less stress on the tree since it is dormant, and you also allow it to repair itself in the spring once it wakes up. This whole process does make sense, and is easy to remember. All you need to know is that the colder it is, the more likely it is for trees to heal faster and more effectively after pruning. So, if you’re considering trying your own do-it-yourself pruning, be sure to use clean, rust free tools. 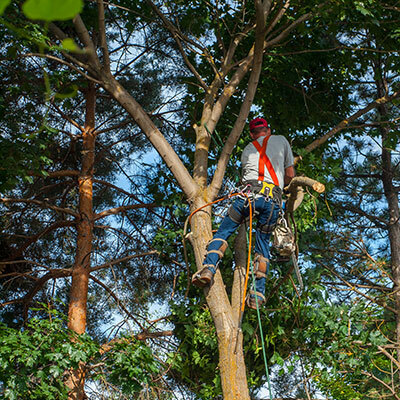 Whenever you are cutting the branches, don't cut off more than 25% of the branch, period. Cutting off too much of a branch can expose the tree. But, if you feel like pruning is too much for you, don't sweat it. Just give us a call, and we can get out and prune it without you having to work on it at all.